Members of the Bradshaw Foundation investigate the ancient cave paintings of the Chauvet Cave in France, under the guidance of the Founding Project Director Dr. Jean Clottes. 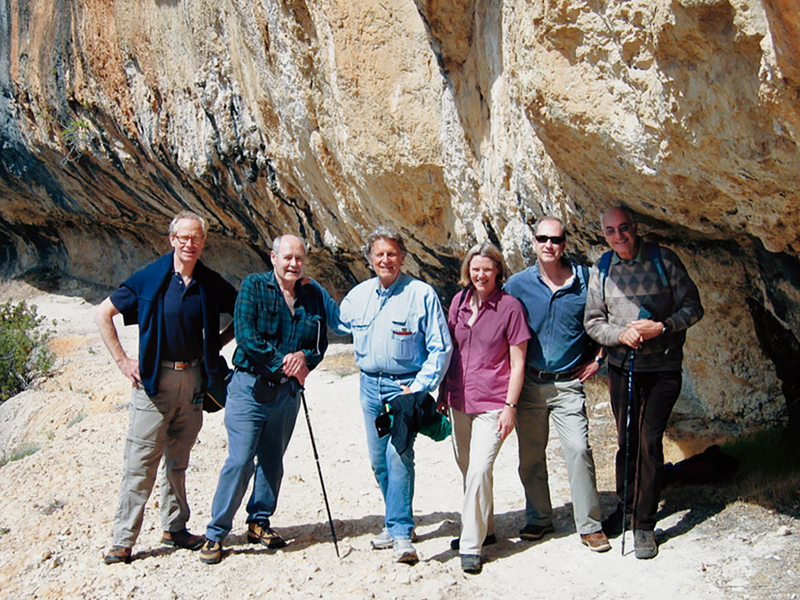 In May 2005 members of the Bradshaw Foundation were afforded the rare privilege of an extensive tour of the Chauvet Cave by the Founding Project Director Dr. Jean Clottes. The party was made up of the Bradshaw Foundation President, Robert Hefner III, the Chairman, Damon de Laszlo, the Coordinator, John Robinson, and myself. Joining us was Jill Cook, the Curator of Prehistory at the British Museum. Approaching Chauvet, the journey itself feels to be of importance. The road shadows the Ardeche River as it slowly but powerfully meanders its way through the thick deposits of white Dogger/Malm carbonates and olive green foliage. As the road climbs, the deep gorge becomes progressively more impressive, until one reaches the significant arch, an unquestionable landmark for our Palaeolithic predecessors. 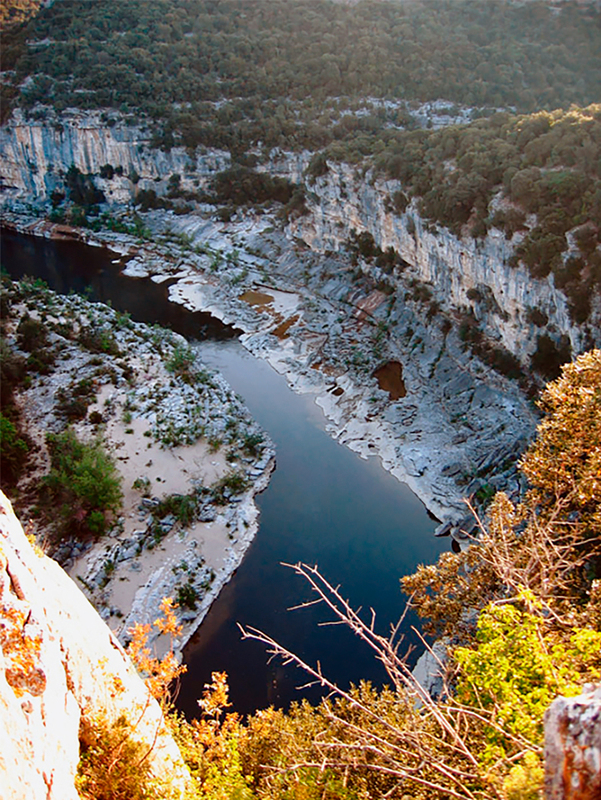 It is these soft carbonates that allowed the Ardeche River to cut through and form this grand arch and abandon its former oxbow to a fertile field and small, sheltered valley so suitable for both people and animals of the time. At the head of this valley, high up in the cliff, lay the entrance to Chauvet Cave. The final approach across the vineyard, then into the undergrowth to follow the goat trail up on to the stone path, was arduous enough to induce a heady breathlessness, which only added to the anticipation. The original entrance to the cave had been concealed by subsidence millennia ago. The new entrance, discovered by Monsieur Chauvet et al in 1994, lies just above. A neighbouring cave 25 metres away, surveyed and found totally empty, has become the storage unit for the Chauvet survey equipment. Here we kitted up. And as divers, free-fallers, all atheletes, all combatants, know, kitting up stimulates the adrenal gland. Ready to begin. 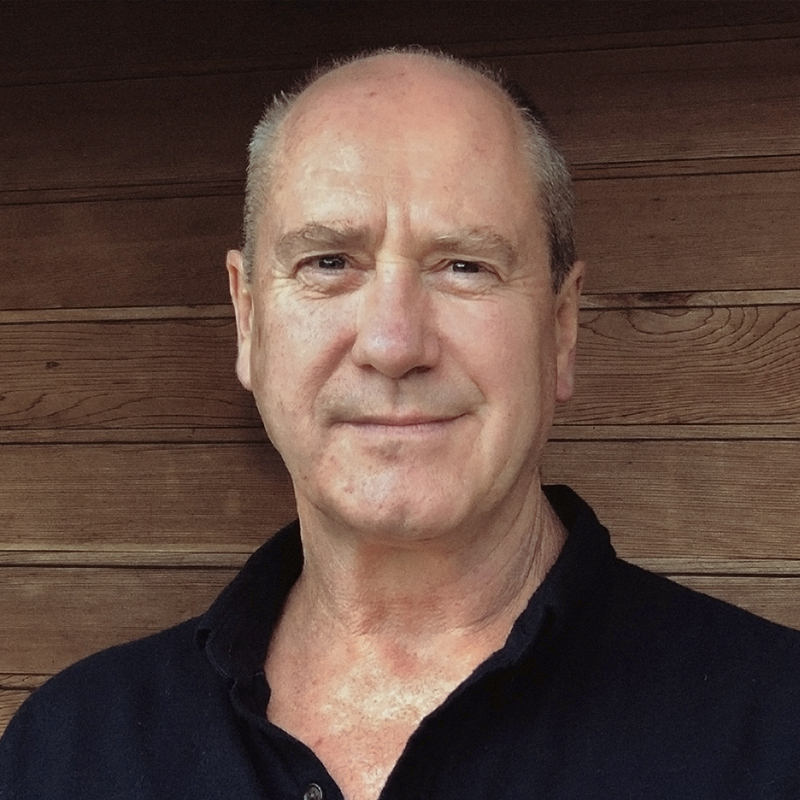 In all candour, there was general nervous laughter - the prospect of being locked in to a subterranean sealed unit mixed with the imminent confrontation of the oldest known art of Mankind was very surreal. And so into the cave. John Robinson, who had been into the cave with Jean Clottes in 1999 and 2001, joined us on the trek to the entrance. He was to film the group prepare and enter. The two hours he spent overlooking the valley in the fierce Mediterranean sunshine, knowing that we were beneath in a cool, dark, alternate world, was by all accounts an exillerating experience - 'initiation' comes to mind. The initiation took 3 hours. The group retreated - quietly, humbly, and proudly - to the hotel. A late lunch heralded a welcome release of emotion, as each recipient described his and her ebullient reactions to this extraordinary place. Jill Cook exclaimed "I have been lecturing on Chauvet Cave for 10 years, and now I have actually seen it!" Had her feelings changed?